For many summer is in full swing and it’s far too hot to even consider turning on the oven. While here in Scotland, it’s pleasent but not swelteringly hot or anything crazy. But I still do not want to spend hours with a hot oven on heating up my kitchen . And that is where no bake treats like my No Bake Raspberry Almond Granola Bars are the answer to your prayers. 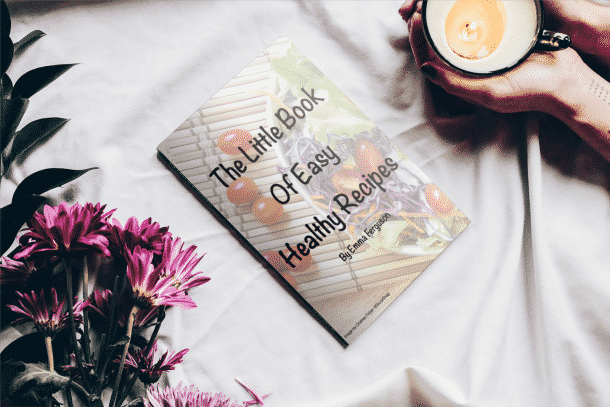 They are sweet enough to satisfy cravings for something sweet but healthy enough, that they could almost be considered a health food! ☺️ Best of all they come together in a flash and no baking is involved. These no bake raspberry almond granola bars are not a million miles away from my No Bake Peanut Butter Ginger Chocolate Chip Granola Bars. The principles are very much the same except this time almond butter is the nut butter of choice. Along with some ground almonds and almond flakes to really boost that almond flavour. So as you can imagine you really need to be a fan of almonds to enjoy these bars. I’ve used freeze dried fruit quite a few times on this blog. I think they are a great ingredient to use and more and more UK supermarkets are stocking them at a reasonable price. Are they available elsewhere in the world? Are they easy to find and are they cheap? I do hope so because the freeze dried raspberries add a little touch of fruity zing to each and every bite. 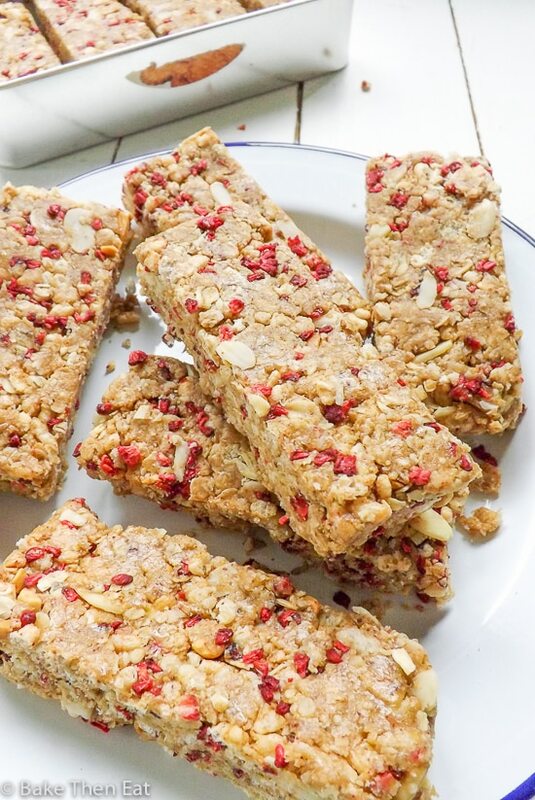 Adding fresh raspberries would make these Granola bars too wet. So if you can, when you make these use freeze dried fruit. We also have rolled oats, quick oats (see notes in recipe for advice) and Rice Krispies. 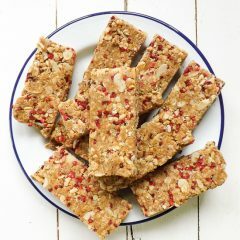 All these ingredients give us a soft yet crunchy granola bar that is perfect for snacking on and great for lunch boxes. As with my last no bake granola bars, I recommend keeping these in the fridge, they keep a little longer and they are not so crumbly when you come to eat them. 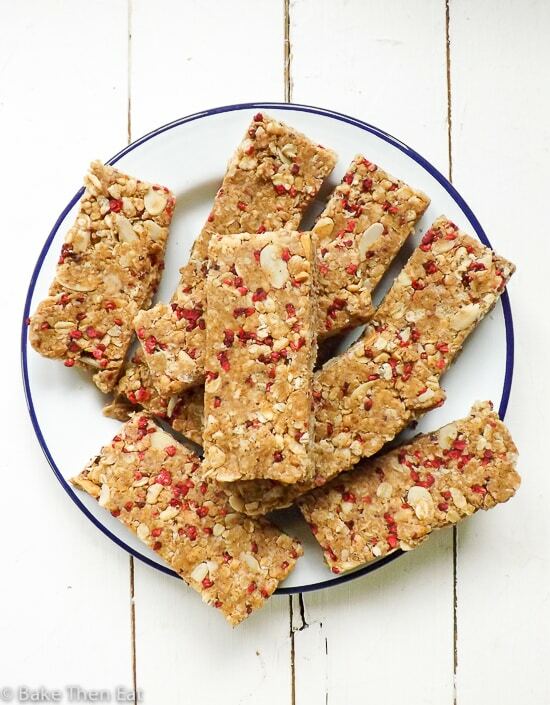 All in all these are easy to make and packed full of nutty goodness. So what’s stopping you? 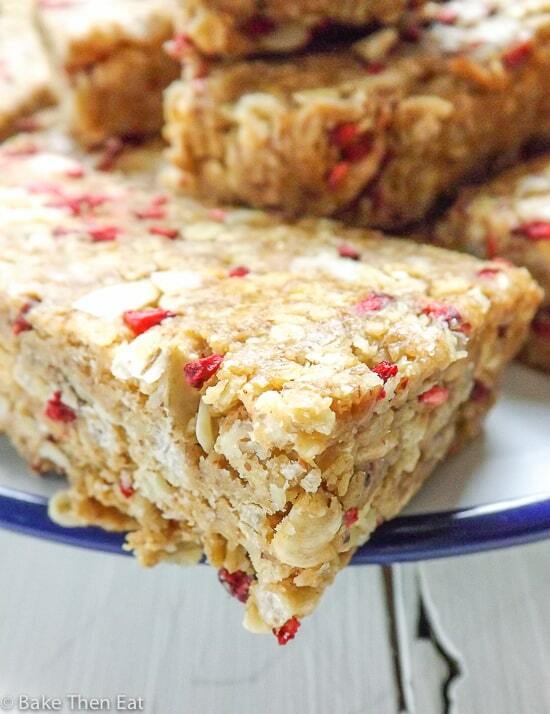 No Bake Raspberry Almond Granola Bars are a Vegan and easy to make Gluten Free treat. Chewy and packed full of flavour and healthy as well! Line an 8x8 inch square tin with baking parchment and place to one side. In a large mixing bowl microwave on high for 30 seconds the almond butter and agave nectar. Stir the two ingredients together until they are well mixed. Pour in the oats, quick oats and ground almonds then mix until everything is well covered. 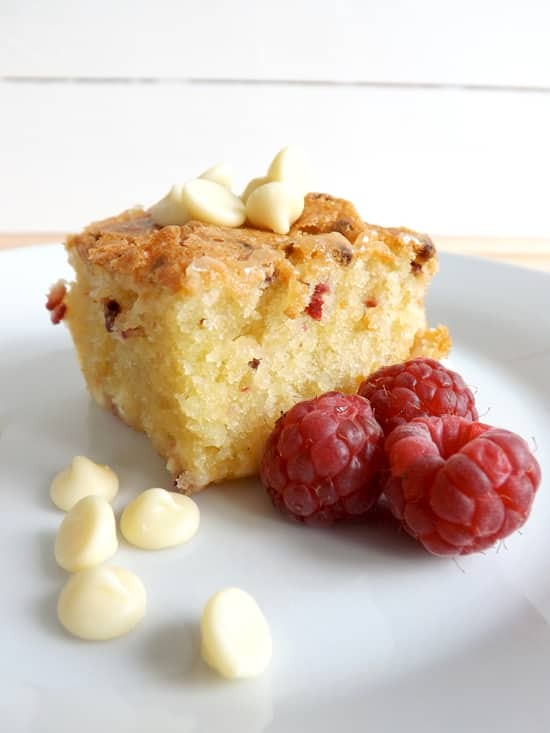 Gently fold in the Rice Krispies, flaked almonds and freeze dried raspberries. Pour the mixture into your prepared tin and flatten it down with the back of a spoon. Place your tin in the freezer for 30 minutes. Take the tin out of the freezer and cut it into 10 bars. Wrap each bar in baking parchment to stop them sticking together. These bars are best kept in the fridge, but can be kept at room temperature but they will crumble a little bit more. They will be good for 10 days in the fridge and 5 days at room temperature. For the quick oats I just used 2 sachets of instant oats / porridge. If you don't have any just pulse regular oats for a few seconds in a blender to break them up a little bit.Use Gluten Free oats if you need these bars to be free of any gluten. This recipe would be ideal for summer, They look awesome! I love to keep a stash of granola bars like this so I can snack on something healthy instead of grabbing for that bag of chips! Love the raspberry addition, they make the bars so pretty! These look fab! And love the use of freeze dried raspberries. I haven’t seen them at the supermarket (yet!) but who knows with time. I hope you get them soon Lorraine, they are a great ingredient to use in dishes. I LOVE freeze-dried fruit! It can be hard to find here, but usually Trader Joe’s and Whole Foods carry it. 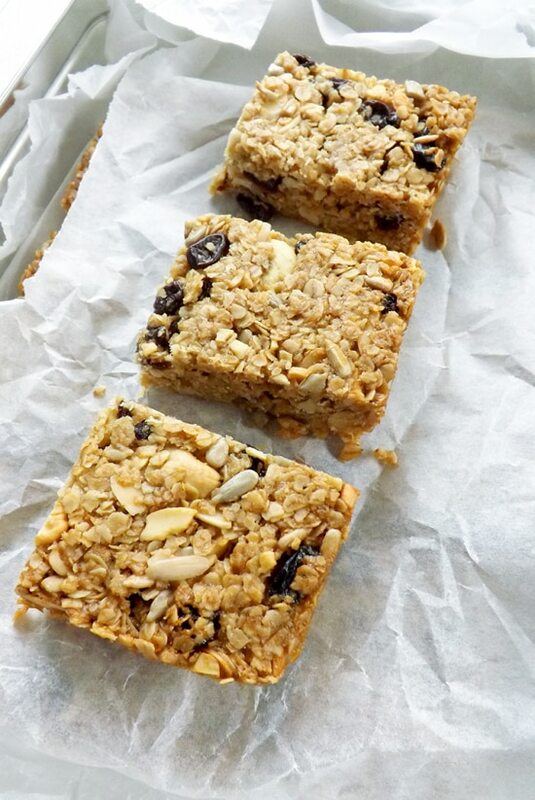 These granola bars sound soooo good. I love almonds and raspberries both :). Have a great rest of your weekend, Emma! Thanks Kelsie, it’s good to know that freeze dried berries are not only a British thing! believe it or not, i’ve never made granola bars at home! 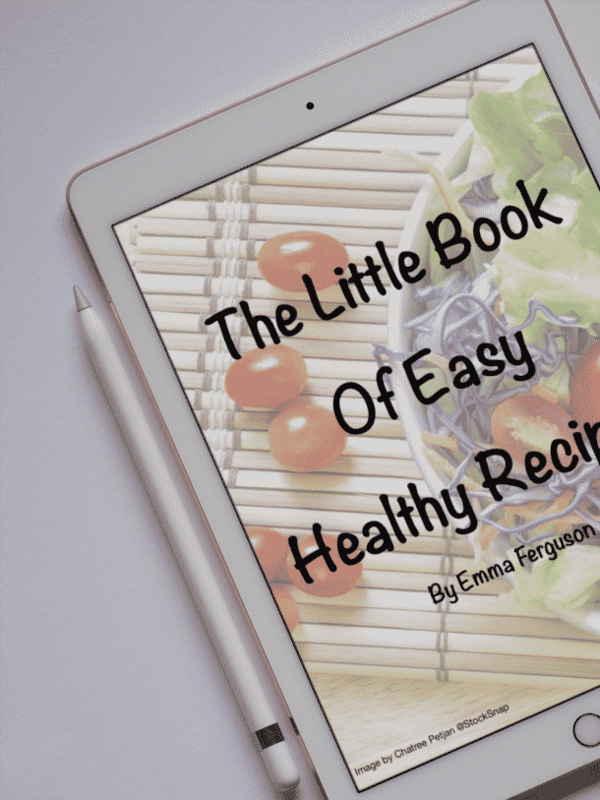 i really should, and this is a great recipe full of wholesome and delicious ingredients! i haven’t come across freeze-dried raspberries before, but i’ll be on the look-out! Thanks Grace, you should try them they are so easy to make. I hope you can find freeze dried berries they have such great flavour. I love NO BAKE recipes in the summer but I also hate them because they’re so easy to OVER EAT – haha! That is the problem because they are ready so quickly and I have no self-control! No bake is GREAT! 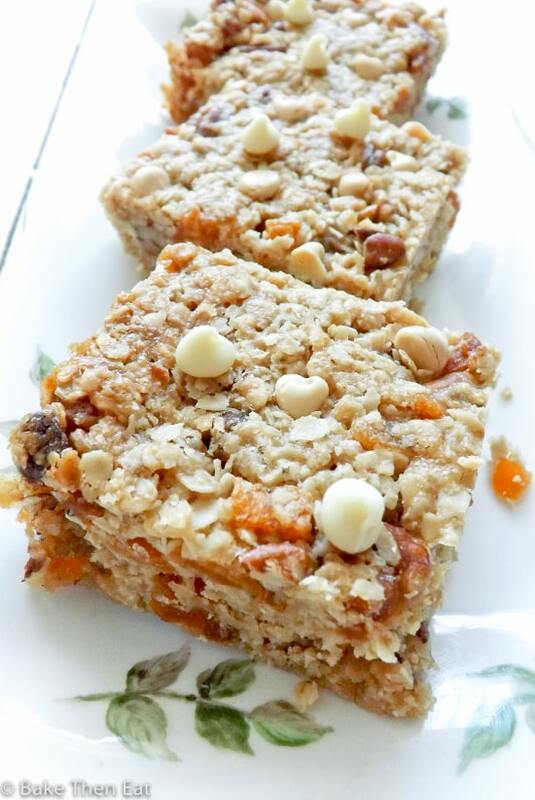 I love homemade granola bars..esp. after an intense workout. 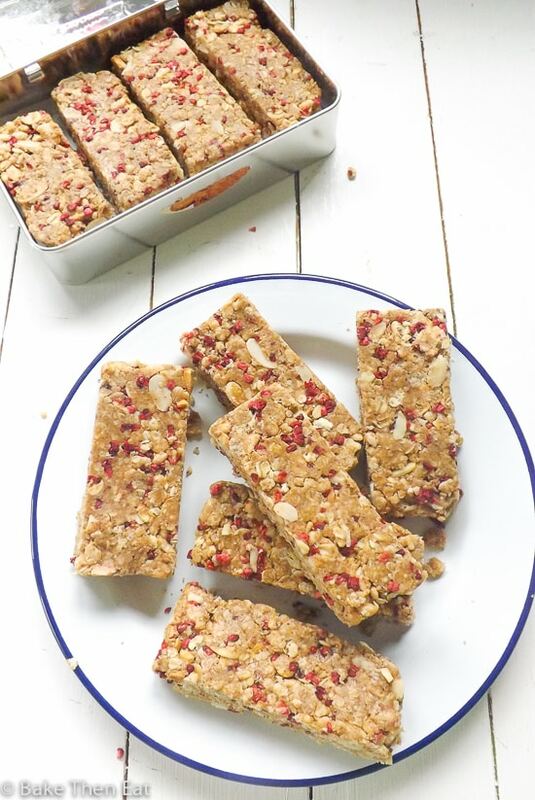 These look scrumptious with almond butter and freeze dried raspberries, Emma. Thanks Angie, they would certainly give you a boost after a work-out!